We've sent numerous missions into space to study the Sun; past and present solar explorers include ESA's Proba-2 (PRoject for OnBoard Autonomy 2) and SOHO (SOlar Heliospheric Observatory) probes, NASA's SDO and STEREO missions (the Solar Dynamics Observatory and Solar Terrestrial Relations Observatory, respectively), and the joint NASA/ESA Ulysses mission. However, most of these spacecraft have focused mainly on the equatorial regions of the Sun, with the notable exception of Ulysses – this probe observed our star at a wide range of latitudes for nearly two decades, until the mission came to an end in 2009. Despite Ulysses' insights, this focus on low solar latitudes has left the Sun's poles relatively unexplored. A lack of imaging data means that scientists must get creative in piecing together pictures of the Sun's polar regions – as seen here in this artificial image of the solar north pole. This image extrapolates low-latitude Proba-2 observations of the Sun to reconstruct a view of the star's pole. While the poles cannot be seen directly, when spacecraft observe the solar atmosphere they gather data on everything along their line of sight, also viewing the atmosphere extending around the disc of the Sun (the apparent glow around the main disc of the Sun, which also extends over the poles). Scientists can use this to infer the appearance of the polar regions. 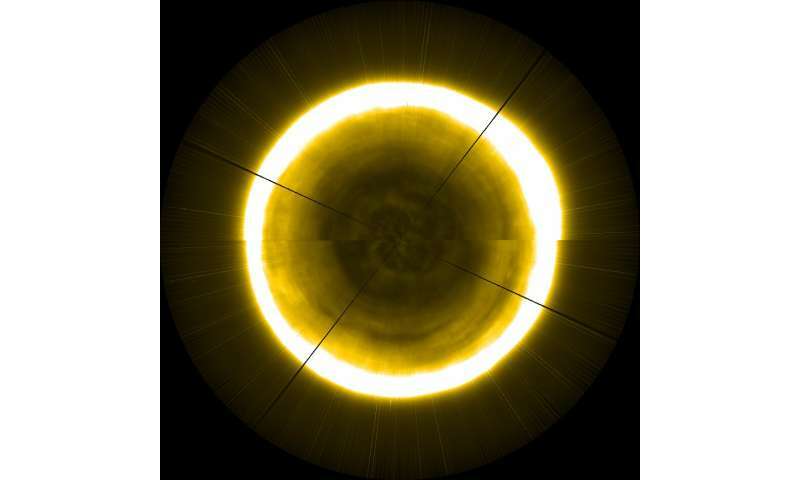 In order to estimate the properties of the solar atmosphere over the poles, they continuously image the main disc of the Sun and take small slivers of data from the outer and upper regions of the star as it rotates, compensating for the fact that the Sun does not rotate at constant speeds at all latitudes. Over time, these small arrays of data can be combined to approximate a view of the pole, as shown in this view. More in-depth information on the process used to create this image can be found here. Signs of this patchwork approach can be seen in this image, which comprises data from Proba-2's extreme-ultraviolet SWAP imager. The line across the middle is created due to small changes in the solar atmosphere that occurred over the timeframe of creating this image. This image also shows a bright bulge on the upper-right side of the Sun; this is created by a low-latitude coronal hole rotating around the solar disc. The polar coronal hole region, which can be seen as the dark patch in the centre of the solar disc, is a source of fast solar wind. It is seen here to contain a subtle network of light and dark structures, which may cause variations in solar wind speed. While such views go a way towards revealing the secrets of the Sun's poles – such as how waves propagate across our star, and how it may create phenomena such as coronal holes and ejections that go on to influence space weather around the Earth – direct observations of these regions are needed in order to build on past data gathered by Ulysses. ESA's Solar Orbiter aims to plug this knowledge gap when it launches in 2020. This mission will study the Sun in detail from latitudes high enough to explore its polar regions, also revealing how its magnetic field and particle emissions impact its cosmic environment – including the area of space that we call home. Are Solar polar regions colder than equator as well, like earth's and all other planets'? "Are Solar polar regions colder than equator as well, like earth's and all other planets'?" According to the Ulysses data, the poles are actually a lot hotter.